Four young Pakistani-American students Gia Farooqi, Hanaa Lakhani, Hasan Usmani, and Moneeb Mian have grabbed the top honors at this year’s Hult Prize Challenge and $1 million in cash. The team’s idea was to empower refugees around the world with a transportation network and they called it Roshni Rides. Hult Prize Challenge is an entrepreneurship competition started by the Hult Prize Foundation, a non-profit organization for social enterprises. This year’s event was held at the United Nations HQ in New York but the participants started work about a year ago to develop a startup venture to restore the rights and dignity of 1 million refugees by 2022. More than 50,000 people from over 100 countries participated and the final six were selected after numerous rounds of competition. At the final event, all teams presented their ideas in front of a huge audience which included a panel of judges as well. Team Roshni Rides’ idea was to introduce a rickshaw shuttle service that based on the New York subway system. The service would then be used to offer affordable transport to refugees living in urban areas in South Asia where it can get difficult to get a cheap ride. The rickshaw shuttle service would also help refugees access schools, universities and employment opportunities with ease. The Roshni Rides business model has been split three ways. First, they will partner with hospitals, schools, and markets to form ‘Roshni Stops’. Users will be given pre-loaded cards using which they will pay for the rides. Roshni Rides plans to use the ridesharing model to bring down the costs for users. 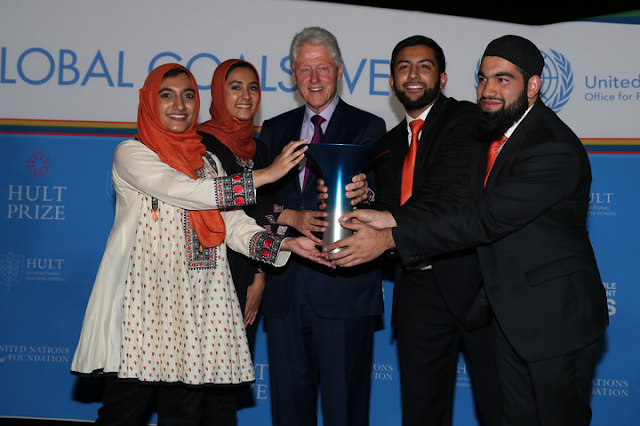 After the presentations, Hult Prize partner and former US President Bill Clinton announced Roshni Rides as the winner of the 2017 Challenge. All four team members fully intend to make their solution see the light of day. They plan on relocating to Pakistan soon, where they also conducted field research while the Hult Prize Challenge was on-going, Using the $1 million prize money, Gia, Hanaa, Hasan, and Moneeb hope to launch Roshni Rides for refugees in Pakistan.